Christened in March 1995 to support the BMW assembly facility in Greer, SC, the Drive Automotive Industries of America, Inc. plant in nearby Piedmont has grown considerably and consistently. In fact, the 1 million-plus-sq.-ft. facility recently grew by another 30,000 sq. ft. to make room for its third blanking line, commissioned this past July. Moving thousands of pounds of scrap underground and out of the Drive Automotive plant falls on the shoulders of 43 hinged steel-belt conveyors, most similar to the one shown here. The facility stamps parts as small as muffler clamps and as large as full body sides. From humble beginnings with one tandem press line and one scrap conveyor, the plant (part of the Cosma/ Magna group of companies) now counts —in addition to its three blanking lines —five tandem lines (four hydraulic and one mechanical), a transfer press and three progressive-die presses. Stamping parts as small as muffler brackets to as large as full body sides, from steel and aluminum, that press lineup yields some 2000 to 2500 tons of steel scrap per week, and another several hundred pounds of aluminum scrap. Following the installation of a new series of scrap conveyors to accommodate the recently added blanking line, the plant now hosts 43 conveyors that move the scrap underground to staging areas and, ultimately, to scrap trailers. 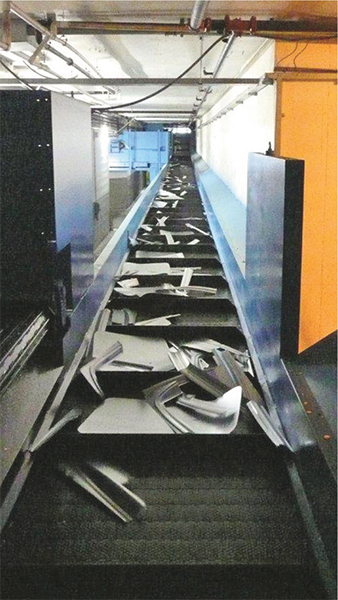 Moving such a great volume of scrap requires reliable conveyors, “and that’s exactly what we have,” says Dressler, praising the plant’s decision made some 20 years ago to rely on German conveyor manufacturer Goessling (with U.S. operations in Johnson City, TN). Dressler notes several additional benefits realized by conveyor-design features, including hinged belt segments fabricated in one piece, from cold-rolled steel, across the total effective width of the conveyor. Another key design feature is the use of roller chains on each side of the hinged belt to drive the conveyors. From its first press line and conveyor added in 1994 to the most recent blanking line, the growth of the facility has been consistent over the years. In 1996 the facility welcomed its first transfer press; a second tandem line moved in in 1997, followed in 1999, 2003 and 2012 by the third, fourth and fifth tandem lines. And they’re all major scrap makers. Here’s the newest Goessling conveyor installed at the Drive Automotive plant, added this past July to serve a new blanking line—the plant’s third. 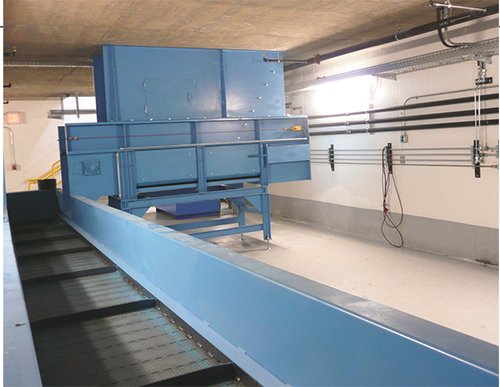 While all of the plant’s scrap-moving conveyors are fixed to frames bolted to the basement floor, several shuttle-style units can move within their frames to index to a range of positions. This allows the scrap, which funnels down from the presses above, to route to the appropriate collection area as directed by the press PLCs. Dressler, who managed the plant’s maintenance department until 2013, knows first-hand the relative maintenance-free operation of its slew of conveyors. The U.S. office sends technicians into the plant once or twice per year to inspect the conveyors and perform basic preventive maintenance such as lubricating the bearings and checking and adjusting belt tension as needed. See also: Goessling USA, Inc.